An IT (Information Technology) helpdesk is a service / resource provided by a company, to its customers / users, to provide information about its products and services, as well as to troubleshoot problems. There are also in-house helpdesks to provide assistance to the employees of a particular company. In today’s trend, having an in-house IT helpdesk staff may not be the most cost effective option. It incurs high overhead and the hired staff may not be as experienced as an external dedicated IT maintenance company. Entrust Network Services is an IT company in Singapore that provides IT helpdesk support for Small to Medium Enterprises (SMEs) in Singapore. Our company first understands your needs and requirements before structuring a IT Support package for you to provide fast response helpdesk support through various channels, such as email, phone, remote-access and on-site support. 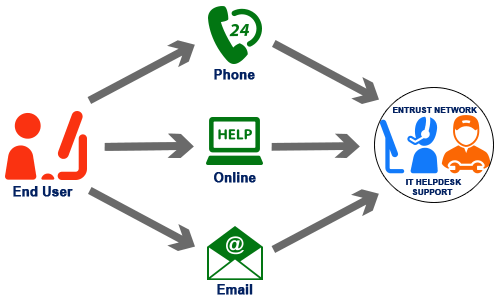 A typical IT helpdesk can effectively perform various functions. Following are the key advantages of an IT helpdesk. An IT helpdesk provides a single point of contact for users to get assistance in troubleshooting, get answers to their queries and to solve technical issues. For example, if a customer is having trouble with an operating system, he / she can call the IT helpdesk of the company that developed that operating system. The IT helpdesk technician will remotely troubleshoot with the customer, and resolve the issue. If the issue is not resolved, then the IT helpdesk technician will escalate the issue to the next level. In the case of an in-house IT helpdesk, it provides a centralized point to deal with technical issues. Employees of the company do not have to wonder whether they should call a particular engineer or a programmer or the support team to resolve the issue. They can simply dial the IT helpdesk, and get help. IT helpdesk companies are trained on a common set of procedures or troubleshooting steps. This helps them to handle the technical issues systematically. For example, they start by troubleshooting with the basic steps first and then move on to complex troubleshooting steps. This helps to resolve the customer issues fast and effectively. Service tickets are also generated each time a customer or a user calls in to report issues. This helps to keep a track of the customer issues and provide a resolution in a timely manner. A customer calling in multiple times regarding the same issue, do not have to explain the whole issue again, they can just provide the ticket number to the IT helpdesk technician. Unresolved issues / tickets can be prioritized as well. The IT helpdesk can create a historical log report by combining all the issues reported by the users, and how they were resolved. This report can be used as a reference point to troubleshot identical issues that might pop-up in the future. If a user has an ongoing issue, then this report can be used to identify that as well, and provide a permanent resolution. IT helpdesk support can also use the data / information they gather on a daily basis to run performance reports. This will enable the company to identify which hardware or software are consistently experiencing issues, and take necessary actions to provide a permanent resolution. Having an outsourced IT helpdesk support is beneficial for the customers, internal employees of an organization and for the company as well.